Sleek, seal black new look; still featuring 9 ultimate programs for high-performance athletes. Take your athletic performance to the next level. Featuring nine programs (4 strength, 2 warm-ups, 3 recovery), the Compex Sport Elite Seal Black Muscle Stimulator can tailor your training to your exact needs to help you maximize your training without muscle fatigue. The Compex Sport Elite Seal Black Muscle Stimulator strengthens areas of your body that are tricky to train at the gym, which helps build more muscle and improve endurance to help you reach your personal best. It's lightweight, easy to use and ideal for competitive athletes. With an updated logo, new carbon fiber face plate, soft touch casing, and latest color (seal black), you can expect the same results with the Compex Sport Elite Seal Black Muscle Stimulator. 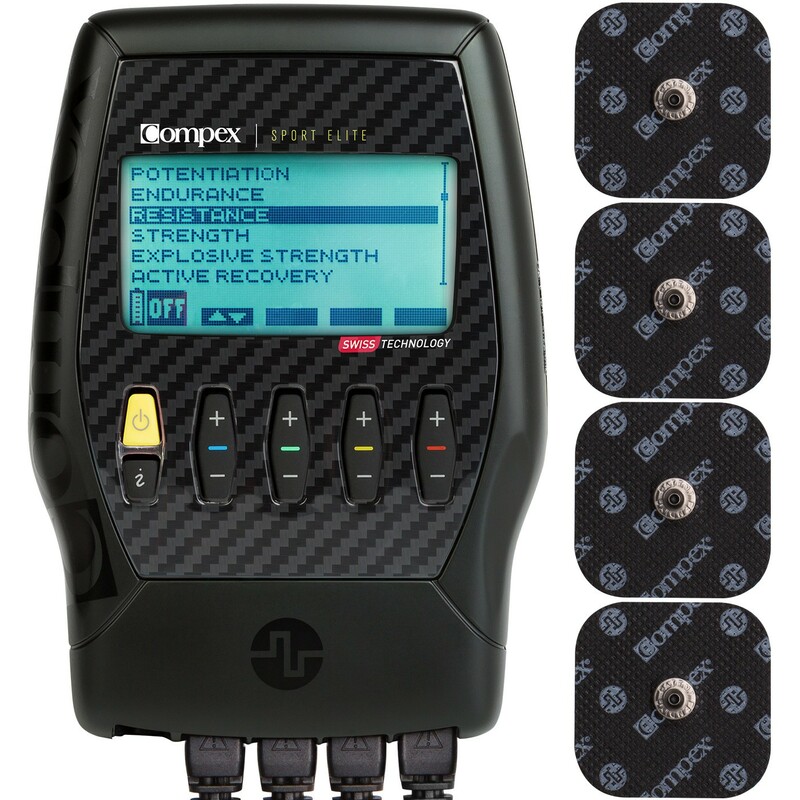 Compex Sport Elite Seal Black Muscle Stimulator helps you gain more power, strength, and endurance. Combined with your existing training plan, the Compex Sport Elite Seal Black Muscle Stimulator enables you to target your training and strengthen more muscle in less time so that you can achieve peak performance and fitness without muscle fatigue. Featuring nine programs and five levels of progression, the Compex Sport Elite enhances your muscle performance, whether you use the muscle stimulator for sports training, endurance, exercise, muscle development, massage, recovery or warm-ups-giving you the competitive advantage you need to achieve your personal best. Increases muscle capillarization (blood flow) and establishes a working regimen for oxidative power of endurance muscle fibers. Targets slow-twitch muscle fibers. Builds muscle size, strength and density, optimal for toning muscles. Targets both slow and fast-twitch muscle fibers. Targets fast-twitch muscle fibers. Increases sheer strength and works the muscles at maximum power with less risk of injury to joints and tendons and virtually no cardiovascular or mental fatigue. For developing short bursts of power without the traumatic or violent movements associated with conventional training. Produces a muscle twitch to clear lactic acid, increase blood flow, promote muscle relaxation and enable a faster recovery from muscle soreness and fatigue. This program is best used right after a training session. Does not contract the muscle. Produces a very low constant frequency to induce a gentle muscle contraction and vibration to increase the blood flow. This program should be used after training sessions and competitions. The Compex Massage program produces gentle muscle twitches, like a massage, to facilitate recovery from muscle fatigue and to help recover muscle strength after training sessions and competitions. Warm up muscles faster without psychological, muscular or cardiovascular fatigue. Back ordered but got it! Was worried because it ended up being back ordered but they came through with an upgrade! Satisfied customer!! Pros: Great product and support! Same quality product as on other sites for a more affordable price. He loved it and I didn't have to spend a lot. Thanks! I had no problems ordering receiving and using this product. Love it!